Hi friends! I hope you are having a great day! We are doing pretty good. We had a great Thanksgiving then we do Thanksgiving AGAIN on Friday with my hubby's extended family. Today, we will have a family day. :) Though, I did leave my wallet at my mom's house that is 40 miles away and I think the kids are getting a cold. Oh well. 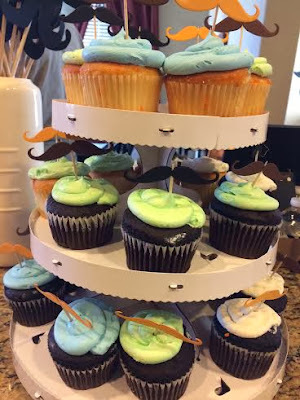 On one of my previous posts, I mentioned that I made a mustache craft for my friend's son's birthday. Here it is. The little guy wanted a mustache bash and that he got! It was a super cute party! My friend mentioned to me that she needed some way to dress up the cupcakes and I told her that I would make cupcake picks for her. She is so sweet and her son is a doll so it was my pleasure. I used The Cat's Pajamas Mustache Cut Ups for these. 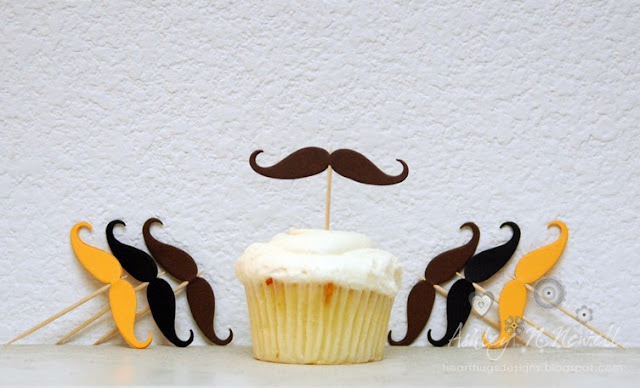 I die cut two mustaches for each pick and then used a double stick tape runner to cover on mustache in glue, then I placed the toothpick and added the other mustache. These turned out pretty cute! Here's one on a random cupcake I bought Dustin from Target. And here they are at the party. Cute! Enjoy your family day! So cute! And fun! I bet they were a hit! So fun! Hope your Thanksgiving went well!!! Awww, so adorable! What a cute idea!